The Village in the 1960s was a hotbed of creativity. In one of the most defining moments of that decade, in December 1960, a twenty-year-old Bob Dylan moved here to play the clubs and become a recording artist. Photographer Fred W. McDarrah was the photographer behind the Village Voice at the time. McDarrah had a fifty-year association with the paper that chronicled the post-War counterculture and captured images of all of the artists, writers, politicians, social movements, and musicians of the day. The Estate of Fred W. McDarrah has graciously allowed GVSHP to offer prints of several images of Dylan and other iconic sites and figures of the era for sale to support our work. You can see several of the images below, and click here to see all the images from Bob Dylan’s Village. Click here to see the newly added images of the Beatles, Jimi Hendrix, Andy Warhol, David Bowie, Yoko Ono, John Lennon, Roberta Flack, Mick Jagger, Janis Joplin, Charles Mingus, the Doors, and the Rolling Stones, prints of which are also available for sale in support of GVSHP’s work. 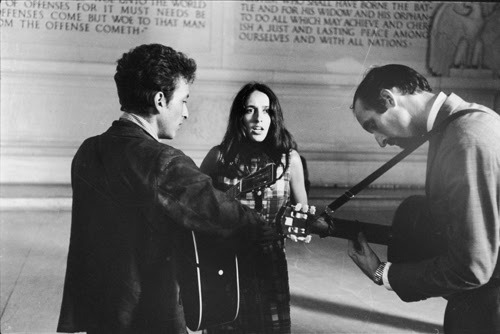 The below image of Dylan, Joan Baez, and Paul Stookey (from Peter, Paul, and Mary) playing together at the Lincoln Memorial was taken on the day of The March On Washington, August 28, 1963, when Martin Luther King Jr. delivered his memorable “I Have a Dream” speech. Purchase a print of this iconic image here. There is perhaps no more recognizable image of Bob Dylan than this famous “salute” pose taken by McDarrah in Sheridan Square on a cold January in 1965. The image was taken the week Dylan recorded “Bringing It All Back Home,” and has been used by everyone from Martin Scorsese, who put it on “The Bob Dylan Scrapbook 1956-1966” (the companion DVD to No Direction Home, his “American Masters” Dylan tribute), to Dylan himself, who used it on the cover of 2014’s Complete Album Collection Vol. One. Cementing the epochal nature of the photo, it was placed on the cover of the very last print issue of the Village Voice, allowing Dylan to symbolically signal the end of that era. To purchase prints of Dylan saluting, click here. The following image of Dylan was taken on a bench in Sheridan Square on January 22, 1965. Click here to purchase prints of Dylan on a bench in Sheridan Square. The following image of Dylan was taken on a bulldozer in Sheridan Square on the same day, January 22, 1965. Click here to purchase a print of Dylan on a Bulldozer. This image shows Dylan performing at Cafe Wha? on MacDougal Street, February 6, 1961 with Karen Dalton and Fred Neil. Click here to purchase a print. We also have photos of some of the places Dylan frequented and played in the Village, including Kettle of Fish bar at 114 MacDougal Street, Cafe Wha at 115 MacDougal Street, and the White Horse Tavern at 567 Hudson Street. Click here to purchase a print.